I wrote this article for a leading Australian business magazine, but I thought it worth sharing here also. 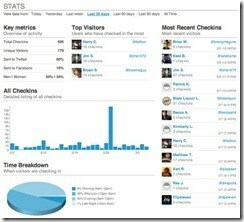 If you know all about Foursquare already then there is no need to read this post! It does however contain some “top tips” towards the end of the piece. The first question many of you may be asking is what is Foursquare? No doubt you would be using Twitter and Facebook, but there is another social networking service on the rise that is worthy of some attention. Foursquare is a location based social network and it uses the capabilities of your smartphone to locate you and then provide the option to “check in” to places around you based on your location. 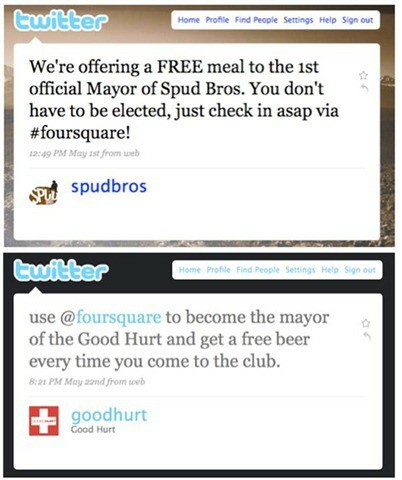 Foursquare was launched at the South by South West (SXSW) interactive festival in Austin Texas in 2009, and was immediately picked up by those early adopter types that are always the first to try out new products and services. 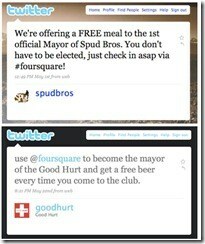 Since launch it has also been adopted by more than 3 million users worldwide as a way to keep up with where friends are, as well as compete with other Foursquare users for the title of “Mayor” – awarded to the person who most frequently visits a particular venue or place over the last 60 days. So why should we worry about location based applications? Haven’t these been promised for years? For many years now, we have heard about the promise of location based services, or LBS for short. The often over-used example is where you are “walking past a Starbucks and your phone alerts you to a special offer inside”. Without going into intricate detail, you will have to trust me that technically and commercially this will never happen. With Foursquare, the problem of determining the exact location of a customer, and their proximity to a store or service without breaching any privacy laws is elegantly solved as the user implicitly and overtly determines where they are and who they want to alert by checking in manually at each venue they visit on their mobile. 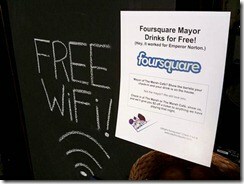 So how will Foursquare benefit my business? The team at Foursquare has been very forward thinking to include the ability for a store owner or venue to not only “claim” their listing in the Foursquare directory (and add contact details, opening hours, website address etc), but also provide very detailed statistics on who visits (checks-in) to your venue, how often and with whom (eg do they bring business from other Foursquare users). 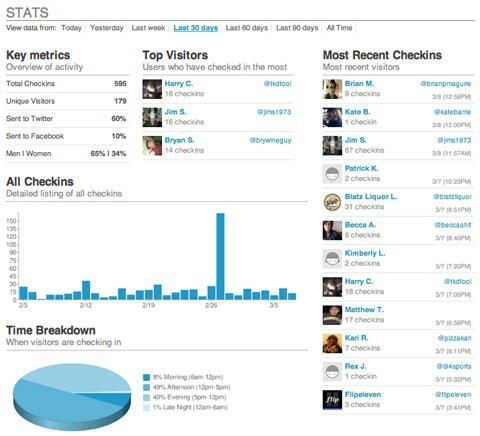 It also will tell you the busiest hours of the day, and days of the week that Foursquare users visit your establishment. A user’s ability to link each “check-in” with their Twitter and Facebook feeds means that your brand could potentially be in the minds of literally hundreds of their followers each time they visit your store. It also means that you can use these existing channels to offer specials for Foursquare users, ensuring that these early adopters visit your store, and tell others about the specials or discounts they available while there. On my recent visit to Australia, I noticed that Sydney and Adelaide seemed to have the Foursquare bug by the number of venues not only listed on the networking site, but also the frequency of visits to each site, as well as the number of Mayors that have sprung up for each venue. Interestingly Melbourne does not seem to have taken to Foursquare in the same way. 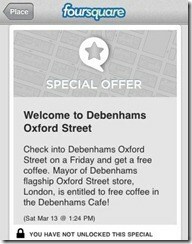 In London high street retailers as Debenhams are promoting offers are available at their store via Foursquare. 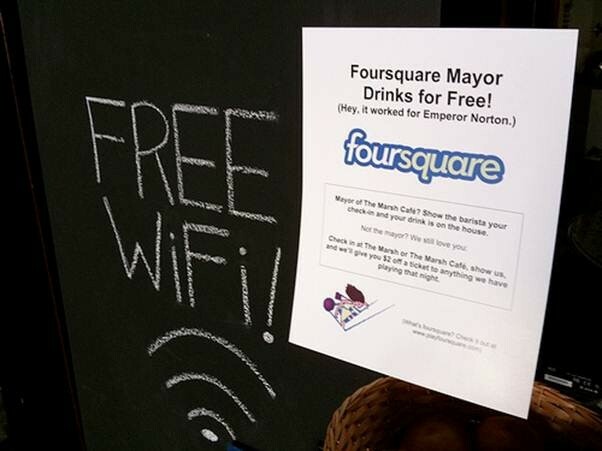 In the example below, the Mayor (person who visits this location the most frequently) gets a free coffee. 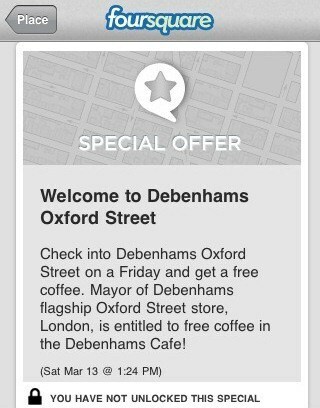 Suddenly, Foursquare as become a social currency (and a tangible one when you factor in the price of a coffee in central London). Dominos Pizza has been offering the Mayor of each of their UK stores a free pizza every Wednesday night, and UK CEO Chris Moore attributed a nearly 29% increase in pre-tax profit to their social media initiatives and its Foursquare promotion. 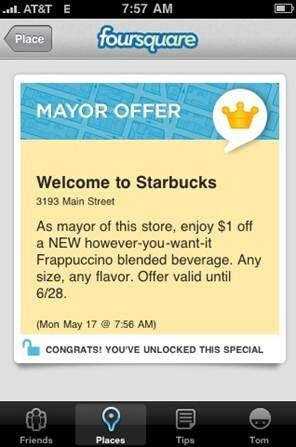 Starbucks in the US are now offering the Mayor of each of their stores $1 off their coffee, proving that Foursquare is becoming a true social currency, which can be earned through loyalty. 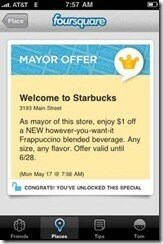 Perhaps in the future the humble coffee card will be replaced by an automated system such as Foursquare. So if you are looking for ways to increase footfall, drive customer loyalty and attract those hard to find early adopters into your store what can you do? Sign yourself up to foursquare at http://foursquare.com/signup and start using the service to understand the dynamics and how other people use it. Claim your venue by ensuring first you are listed on the site, then start the validation with Foursquare via the site to ensure you have control of the listing and can utilise the powerful visitor analytics only available to store owners once verified. Note that Foursquare are limiting the type of venues at the moment to mainly retail/food outlets and not offices. Craft not only a Mayor special (which can be loaded into the Foursquare system and displayed automatically to those people nearby checking venues in the area via foursquare) but a Foursquare user special to drive footfall and repeat business. Put a sign on your front window encouraging Foursquare users to “check in here”. For those not using Foursquare it will drive buzz and discussion and show that your company totally understand these new social channels. Tell the world via your website, Twitter and Facebook pages that you are on Foursquare and have special offers available to those who check-in. The last point may be worthy of some more traditional PR, as the Foursquare phenomenon is fairly new in Australia you may be able to claim the bragging rights of “the first store in the area on Foursquare.” The media love social networking stories, and the window sticker would make for a great shot for TV. Foursquare has also introduced a competitive element into the platform, as users can collect virtual badges based on the types of places they check into or the time of day or frequency. The title of Mayor of a venue has also become very competitive in London, with many companies such as Louis Vuitton actively encouraging visits to their store to increase the chance of becoming that venue’s Mayor. This gaming element introduces a real stickiness to the platform and ensures users check in on a regular basis in multiple places to improve their status. If you need any more convincing that location based social networking will take off, then the recent news that Facebook has developed a rival service called “places” should tell you that more and more networks are going mobile and location based services are finally going mainstream. Indeed in London it is no longer a case of overhearing non-social media types ask if their friends are on Facebook or Twitter, the latest question has become “are you on Foursquare”?